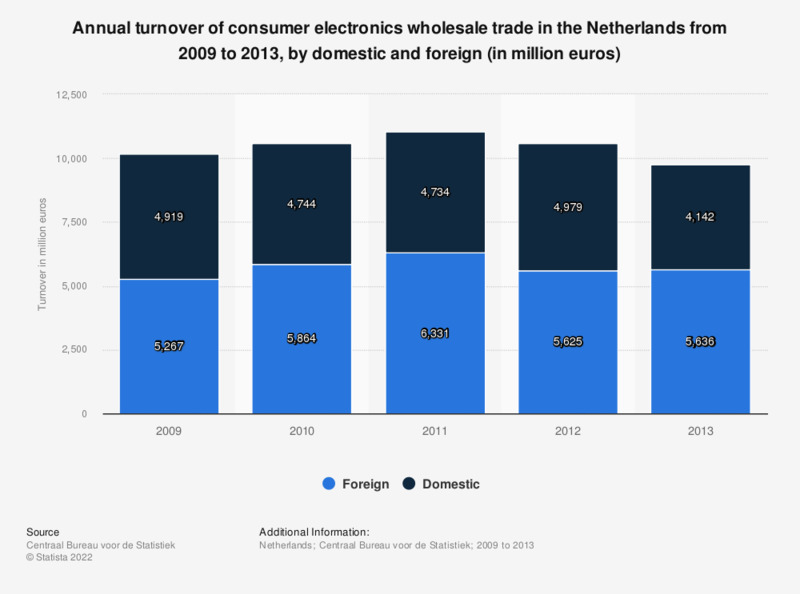 This statistic displays the annual turnover of consumer electronics wholesale trade in the Netherlands from 2009 to 2013, split by domestic and foreign turnover. In 2013, the wholesale of consumer electronics generated revenues of approximately 4.1 billion euros through the domestic market and 5.6 billion euros through foreign markets. Net turnover is defined by the source as "business returns, excluding VAT (value added taxes) from the selling of goods and services to customers. Turnover is calculated after deduction of discounts, bonuses, returnable deposits and on-charged freight costs."